I have to admit, while I was a bit taken aback, I appreciated their honesty. Upon reflection, I have to say they were among the most honest and heart-felt words I’d heard in some time. I told them I completely understood and believed they would grow to trust me. If they didn’t, I told them, then it was likely going to be more my problem than theirs. From their response, I knew I was going to get along with those two women and I did. Over the years, we became close and they did grow to trust me. As a pastor, I want people to trust me. It makes my job a lot easier. But I don’t want people to trust me because they feel obligated or because they’ve been told they should. 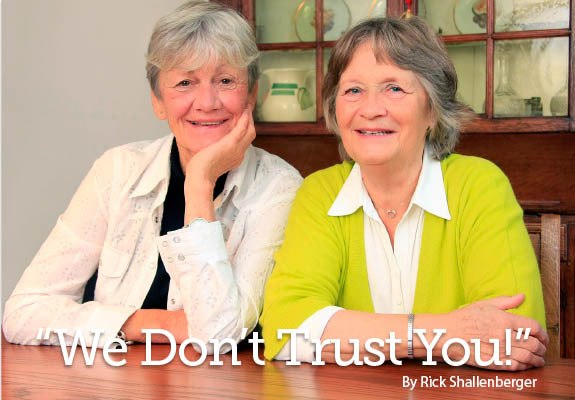 Neither do I want them to trust me because of my title or position. I want them to trust me because I’ve earned it. I didn’t always feel this way. When I was young I always thought pastor was synonymous with power. You get ordained as a pastor and immediately people look up to you, respect you, listen to you and follow you. OK, stop laughing please—naiveté is one of the curses of youth. Perhaps that’s one of the reasons God chose to wait to ordain me until I was almost 40. His wisdom always prevails. By the time I became a pastor, I had learned that power is not synonymous with pastor. Love certainly is. Tenderness is. The ability to listen is. And when I practiced these traits, respect followed. I learned respect as well as trust is earned, not given. I wish more Christians could learn this lesson. We aren’t trusted because we claim to be Christian; we are trusted when we act like Christ followers; when we follow the example of Jesus. The Creator of the universe came among the creation (we call this incarnation) and he never once demanded respect. Instead, he loved. People came to him because of his example—not because he displayed power, but because he displayed compassion. He came as a shepherd to gather his sheep, not as a king to rule over subjects. He taught by example. Is it any wonder Paul told us to follow him as he follows Christ (1 Corinthians 11:1)? The disciples trusted Christ because he lived what he preached. The people followed him because they saw that he understood and cared. The women followed him because he treated them with respect, not the typical disdain of the day. Children followed him because he related to them. I hope we are beginning to see a pattern here. Christians are to follow the example of Christ. It’s unfortunate that Christians are known more for what they are against than for what they are for. Being a pastor or Christ follower is not about getting trust, respect, power or anything else—it is about giving of the self to others. It’s about leading others in love to the One who loves them just as they are. The psalmist said it’s about following our shepherd who lovingly leads us to green pastures and to still waters where we can drink and eat in peace. We are invited to join Jesus as he leads others to that same pasture and calm stream. Being a follower of Christ is about building relationships, which will lead to earned trust and earned respect, which leads to opportunities to teach. I believe all Christ followers can look at the scriptural qualifications for elders and see how to be good Christians. “If anyone wants to provide leadership in the church, good! But there are preconditions: A leader must be well-thought-of, committed to his wife, cool and collected, accessible, and hospitable. He must know what he’s talking about” (1 Timothy 3:1-2, The Message throughout). Then in Titus we read: “It’s important that a church leader, responsible for the affairs in God’s house, be looked up to—not pushy, not short-tempered, not a drunk, not a bully, not money-hungry. He must welcome people, be helpful, wise, fair, reverent, have a good grip on himself, and have a good grip on the Message, knowing how to use the truth to either spur people on in knowledge or stop them in their tracks if they oppose it” (Titus 1:7-9). Notice the focus? A Christian should be one who is looked up to because he (or she) welcomes people. She is “well-thought-of” because of her behavior. In other words, a Christian knows how he or she lives, and love speaks volumes more than being able to quote the Bible or what title he or she has. One of the qualities we look for in a ministry leader is what we call a shepherd’s heart—someone who looks after the needs of others and is more concerned for them than for the self. True Christ followers have this same heart. And when they do, they don’t have to ask for or demand respect, because it naturally comes as a result of how they live. Christians become trusted and respected when we, over time, demonstrate we are much more concerned about people than our personal doctrines, titles or denominational ties. I enjoyed watching the two women grow to trust me, but more, I enjoyed watching them trust what God was doing in their lives through the Spirit. I enjoyed watching them serve others, love others and put others first. In short, I enjoyed watching them follow Christ.